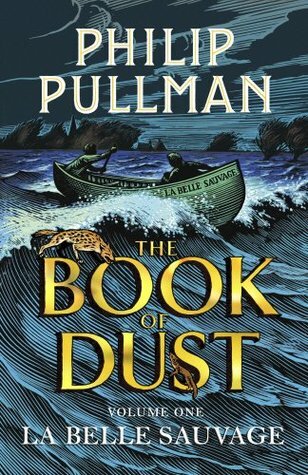 The Book of Dust: La Belle Sauvage by Philip Pullman. At one point he seemed to be showing the moon to Lyra, pointing up at it and holding her so she could see, or perhaps he was showing Lyra to the moon; at any rate he looked like a lord in his own domain, with nothing to fear and all the silvery night to enjoy. I was looking for something. Now I’ve found it, I shall go home. Happy New Year, everyone. May it be lucky and joyful and healthy and full of wonder and books and everything you wish it to be. I used the quiet time between the holidays to savour a book that has been on my reading pile since its publication in October. However, I knew that I would need some quality reading time for this with nothing to interrupt. An eight-hour train ride seemed like a good start … I regularly forget that public transport is not completely advisable for readers who are prone to emotional outbursts. I read His Dark Materials when they came out in German (I also had them all in their first edition until I lent the second and third to someone and they didn’t give them back – don’t do this, it’s absolutely detestable) and after reading this what is effectively a prequel but also so much more, I really want to read them again. This time in English to hopefully catch even more of that beautiful language the author uses. Lyra was one of my most prominent childhood heroes and now getting this expansion of her story is like a gift I never considered necessary yet I now wouldn’t want to miss it for the world. It is an epic adventure in its own right full of daring and danger but also surprisingly light and with a good ounce of humour at times. The German title is a little more descriptive in calling this “Across the wild river”, which at the same time might give you an idea of the story while also being absolutely misleading. Saying anything about the story would be a vast injustice to everything that cannot be told so to avoid that I won’t say anything more about it. Apart from once again admiring that word magic in the narration itself. A master wordsmith indeed. If you are not familiar with this fantastic alternative universe, I cannot recommend it enough. I’m trying to figure out if recommending starting with this book would make more sense than starting with the original first book because then you’d read them in their chronological order but maybe wouldn’t catch the references. Quite difficult. Maybe I’ll have an answer once I’ve read Northern Lights (also known as The Golden Compass. Don’t get distracted by the movie. Unless you’re looking for examples of how-not-to-adapt-a-book-to-screen.). Would you read books in their internal chronological order or their publication order if given the choice? Share your thoughts and teasers in the comments! Good teasers. Seems like they show some of the variety of writing styles the author employs. My Teaser is from The Hazel Wood by Melissa Albert. Great teasers. I do intend to read this one someday since I enjoyed His Dark Materials. This week I have A Mortal Likeness by Laura Joh Rowland - a historical mystery from my review stack. Happy reading! Not sure how I read a series as I'm known to sometimes jump in anywhere. Love the opening and hope you enjoy it. Happy New Year. Sounds like a great time to get involved in a book.